Try not to lick your cracked lips. Don’t think of water. Listen to the Saracen arrows buzz past. Don’t flinch! Most of all, hold the line! Grumpy old Sir Fulk can’t stand the heat. He raises his helm and ignoring the shouts of the other crusaders, waits while his son, Sir Joscelin, shares the last of his flask. An arrow takes Sir Fulk in the throat. There’s blood, there’s thrashing, and the old knight dies in the arms of his son, the effete Sir Joscelin. Kurtzhau – age 6 – lets out a cry, as if he too were there, riding out under the baking 12th-century sun to face the army of Saladin. This is four years ago and I’m reading aloud from Ronald Welch’s Knight Crusader. Now, Sir Joscelin — he of the camp voice, the silk clothing, perfumed handkerchief, the tough-as-nails young warrior who enjoyed winding up his conservative father with his decadent ways – charges out solo, determined on revenge. Another cry from Kurtzhau. He draws up the covers. 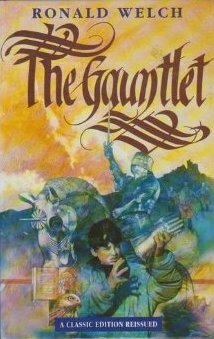 It’s Sunday morning, we’re reading in bed, and only now am I remembering that Ronald Welch, though nominally writing Children’s Fiction — he won the Carnegie medal for this — is ruthless with his body count. Like the Crusader army, I’m caught in a cleft stick. If I stop, Kurtzhau won’t have closure. If I go on… well… Sir Philip, the hero, has a “character shield.” Let’s just say that his friends don’t. I sip my tea and continue. Sir Philip — our hero — wants to ride after his best friend, but his father holds him back. Our hero can only watch as the Turkish archers shoot the horse from under Sir Joscelin. He looks away, but knows they will cut him up like a slab of meat. But suddenly, Sir Philip doesn’t think honor or bravery mean much in this waterless place, when death comes so easily, and with so little meaning. Even so, he must keep formation, for only through discipline can the Crusader army hope to win. And then, avoiding spoilers, I talk about how Sir Philip will regain the family seat in Wales, and how one day — in a book I’ve just secured — a distant descendant will ride off to war in a Mk I Tank. I read on, finishing the last pages of the chapter, taking the thirst-wracked Crusaders to the Horns of Hattin. “Wait and find out,” I say. You only get to experience History Without Spoilers when you’re his age and I’m not going to take that away from him. You see, Ronald Welch (1909-82) was a purveyor of false memories to a generation of boys. Think of Welch as a “The British Harold Lamb” writing YA about young officers or nobles learning to discharge their responsibilities. 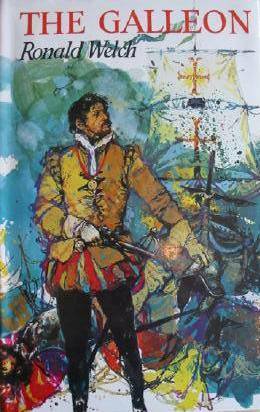 Or think of him as “Bernard Cornwell for boys,” without the bodice-ripping or class war. Like Cornwell, Welch puts you in the middle of really large set piece battles (something Harold Lamb only really managed in his non fiction). Thus, by the time I was fifteen, I was carrying around borrowed experiences of Hattin, Arsuf, Edgecote, Tewkesbury, the Spanish Armada, Edgehill, Naseby, Blenheim, the Peninsular Wars, the Indian Mutiny, the Crimea, the Somme, and – finally – Cambrai. No surprise then that Ronald Welch once had the same stature as Rosemary Sutcliff, of Eagle of the Ninth fame. However, Welch has not fared as well as his female contemporary. 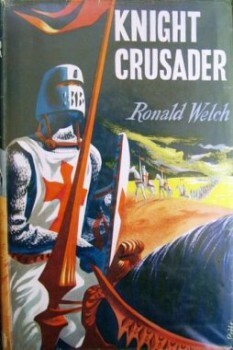 Until the recent collector’s edition by Slightly Foxed, and a grudging re-issue of Knight Crusader by Oxford, Welch has been relegated to the used book stores. We’ve had to pay over the odds for battered second hand copies. It’s not that the books have aged badly. Welch writes good crisp prose, fast-paced plots, and moral grey areas. And he steers clear of comedy racism or lazy sexism. It’s rather that he refuses to follow the approved script for YA books about War. OMG! My best friend just died. War is Tragedy. (Oh, and look at that dying horse.) I will keep my humanity. OMG! My best friend just died. War is Tragedy. (Don’t let the dying horse kick you!) Watch the left flank, chaps! This is not an approach designed to get past the modern gate keepers; the boutique bookstore owners, the school librarians, the fashionable parents who never give their children war toys. However, of the two approaches to War, his offers the most useful life lesson. We all face adversity and tragedy, but bills don’t pay themselves, projects don’t have an auto pilot. Sooner or later, an adult must watch the left flank. Perhaps the reissue of these books will help the next generation learn to do just that. M Harold Page (www.mharoldpage.com) is a Scottish-based writer and swordsman. His debut novel The Sword is Mightier came out last month. His Foreworld SideQuest, Marshal versus The Assassins is available on Amazon for preorder. These sound interesting. I’m also curious about the earlier G. A. Henty’s boys’ historical fiction. I don’t know is the ?US has ever produced quite the same type of literature on the same scale. Perhaps a question of explicit empire? Interesting question. Perhaps because you had the frontier? Interesting. Our westerns vs. Henty and Welch. You had me at “British Harold Lamb”. Now I want all of these. Not, unfortunately, badly enough to pay £216 for the Slightly Foxed editions or to buy them used for considerably more; but if they ever do something a bit more affordable, I’ll be all over that. You can pick them up cheaper if you keep your eyes out. The two standout ones are Knight Crusader and Tank Commander. Knight Crusader is available as a cheap reprint, and even on Kindle. Not on Kindle over here in the Colonies, but some of the inexpensive paperbacks seem to have crossed the broad Atlantic — I’ll have to check it out.